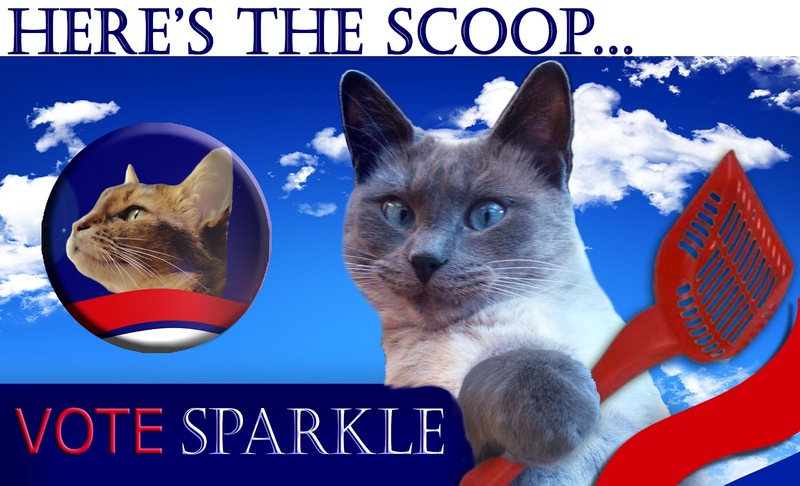 A Tonk's Tail... err, Tale...: SCOOP: "Dirty Litterbox" Campaign Tactics Uncovered! SCOOP: "Dirty Litterbox" Campaign Tactics Uncovered! Will this affect Katie's numbers? Will Sparkle pull ahead in ratings? BOL we are so looking forward to the next update. Have a lovely Sunday. Looks like the kitties are getting into the gutter just like the human candidates. Oh, woe is me! We will be very interested to see if Faraday will change his vote, or now that this scheme has been revealed, if he will stick tight to Sparkle. We are sure it will be down to the wire. Hahaha! Now what do you do, Faraday? MOL. Hmmmm, are these Flaming Balls or just the regular type? It's important. Shocking - a candidate tossing around balls like mousie toys! Let it be known that bribing, with balls or anything else, has NEVER been part of MY campaign strategy. Somebody’s made a right balls up! 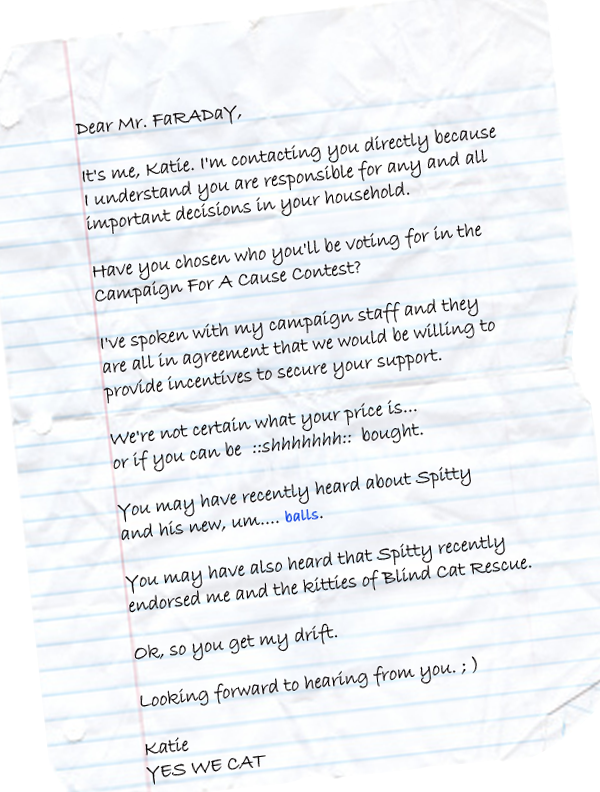 Allie: As Katie's firm supporter, I would ask you to put aside all these minor hairball incidents and focus on the REAL issues...the needy kitties...! Maxwell: though what you say is all true, Allie, you always blush when you're feeling guilty. My you're looking PINK today...Just meowing. This campaign is getting as bad as the humans'!! Oh dear Cod! I will be known furever as Benedict Arnold Quisling or some such dreadful rotten traitor. I'm SORRY! I was WEAK!!! I'd just been TUTORED!!!! They're LADYCATS! They took ADVANTAGE of me in my days of despair!! What can I say????? BWAAAA-HA-HAA-- err...uhm, that is...oh NO Spitty. We totally unnerstand how difficult an important thing like BRASS Balls are! Oh mouse-droppings! The voting box has become the voting litterbox... We now think we will have to wait until the very last minnit before making up our minds. More revelations might come out before then! Didn't you run this already?? How come when WE were doing litter flinging, the poop hit the fan and now it's funny? All will be forgiven if you come to our pawty tomorrow night. Gee, when it comes to incentives, some new balls might be hard to top! Well that certainly is a scoop and would explain why that dude from the National Inquirer is still hiding in the bushes!!! Spitty's balls had nothing to do with my endorsement. It must have been the salmon.